1. I do not work in a cubicle farm. 2. Mental faculties are still fairly quick, though some short-term memory testing is coming up on the “does not compute” side. That’s okay. If it was really important it would have left an impression. Let’s hope the mortgage payment always stays important, otherwise the aforementioned roof will have to be removed from the list. 3. Ravelry. That site is a miracle. If you knit and you’re not there, get there! I love the groups I belong to, they keep me more informed than the evening news. 6. I seriously love my iPad. Connect to the world, read books, play games, keep appointments handy, and communicate with others from the palm of my hand. Gadget whore, that’s me. 7. Gin and tonic. What a fabulous summer cocktail. Little sweet, little tart, little lime, little tingling in my knees when I’ve had a good one. 8. Color. Give me some sharpies or colored pencils and some smooth paper and I’ll be as happy as a pig in mud. (Oooo, look, another genius quotation! You’re welcome.) Lots of times I hesitate to sketch something because I’ll be unhappy with what I did and then I’ve just RUINED the paper and when did I ever think I could draw but those colors are just so beautiful….This is kind of how I buy yarn, too. Which explains my yarn stash. 9. Any illness I’ve ever had has been attended to and cleared up with no side effects. (Well, unless you count two caesareans and their resultant issues and why I’ll never ever be seen in a bathing suit again. No, really, girls, I love you very much and you were worth it. Just remember what I gave up for you and get mommy a gin and tonic.) People who are in chronic pain must be Hercules because if I were in their shoes I think I’d be a sobbing mess who needed commitment papers stat, and I know I’m a big baby afraid of pain because I’m even afraid to vomit. 10. A place to babble nonsense and have people tell me they like it or agree with it or decide to start following me (and not in a creepy way) and I’m very grateful for readers and commenters. It pushes me to someday be that writer I think I’ll be. Or I’ll just keep writing here, either way is okay with me. Thanks. 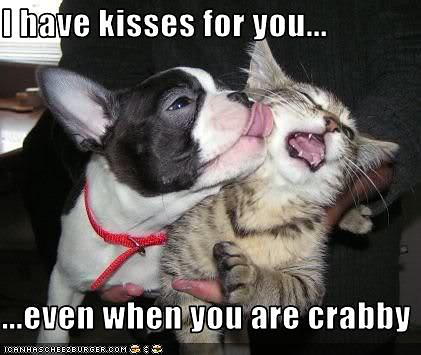 …and you guys are never crabby! Actually, I’m pretty much always crabby. IT’S LIKE YOU DON’T EVEN KNOW ME. GOD! There’s crabby, and then there’s “let me be crabby so nobody sees this great big heart I have here.” You are in the latter category.